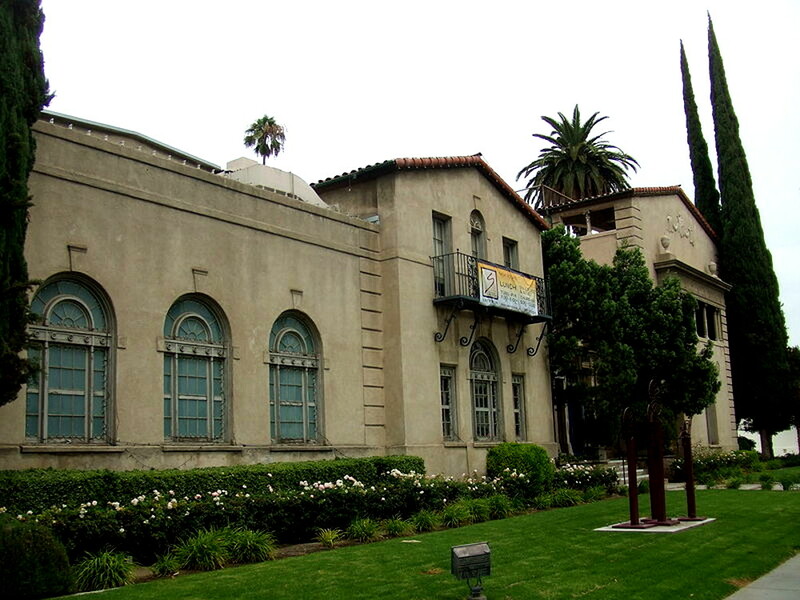 Located in downtown Riverside, just two blocks from the Mission Inn, the Riverside Art Museum is housed in a beautiful 1929. Designed by Julia Morgan, renowned architect of William Hearst’s Heart Castle in San Simeon, California, the building was originally Riverside’s first YWCA. The stunning architecture is a mix of classical fan windows, flowered columns and archways coupled with Mediterranean tiled roofs and wrought iron detailing makes it instantly unique and unforgettable. The Riverside Art Museum exhibits more than twenty changing exhibitions of fine visual art each year. Two dimensional paintings, prints and works on paper are the primary focus of the most exhibitions. These exhibits vary, showcasing the work of regional artists as well as displaying spectacular and important work by historic and contemporary artists of both national and international backgrounds. Three dimensional work is also shown, such as the successful traveling exhibitions of Mata Ortiz pottery from Northern Chihuahua, Mexico, and turned wood vessels from master woodworkers across the United States. The Museum Store offers a wonderful selection of jewelry, books, ceramics, glass and handmade cards that will tempt any shopper who likes one of a kind, gift items. Original art work by regional artists are also available for purchase in the Museum Store, including watercolors, acrylics, oils and quality edition prints. City Cuisine, one of the hippest eating establishments in the Inland Empire, is located in the central, glassed in courtyard of the Museum’s historic building. Open for lunch Monday though Friday from 11:30 am to 2:00 pm, the restaurant offers winning mid day meals, which is a perfect finish to viewing the current exhibitions and visiting the Museum Store. Studio art classes and workshops are offered on a quarterly schedule at the Riverside Art Museum. Available for children and adults. classes are taught in the Museum’s second floor classroom by experienced art instructors dedicated to sharing and teaching the joy and excitement of creating original artwork. Cartooning, gourd painting, clay modeling, watercolor painting and life drawing classes are a few of the most popular class offerings. The Museum’s Education Department presents outreach programs for public and private school classes and youth groups, kindergarten though college age. Art partners is a two hour visit to the Museum that includes gallery tours of the current exhibits with teaching games and quizzes as well as an hour long art projection the Museum’s classroom. Art To Go! is an education program that is presented in the classroom. Based on original prints purchased by the Museum from Self Help Graphics, a print atelier for emerging artist in East Los Angeles, docents from the Museum’s Education Department visit classrooms on a weekly basis with a portfolio that includes history and literature books. activities, and these original prints. Self esteem, respect for cultural heritage and inspiration for developing a creative, personal voice are the goals and results of this remarkable hands on education program. Volunteers are welcome to assist in the Museum Store or with Education Department programs. The donated time of volunteers is a tremendous support to the small, hardworking staff of the Museum. A private, non-profit organization. the Museum is funded by grants, corporate sponsorship, facility rental and Museum memberships, Corporate sponsors and Museum members receive quarterly newsletters, exhibition announcements and invitations to opening receptions. and discounts on classes, bus trips to cultural institutions, and facility rentals. The Museum rents out several spaces in our enchanting building, including the fabulous lobby and atrium, the accommodation Member’s Gallery, and the efficient second floor Conference Room. Weddings, receptions. birthday parties and business meetings are among the most common events held in these rental spaces, Catering for facility rental events is always stylishly presented by Chris and Jerry Baker of City Cuisine.